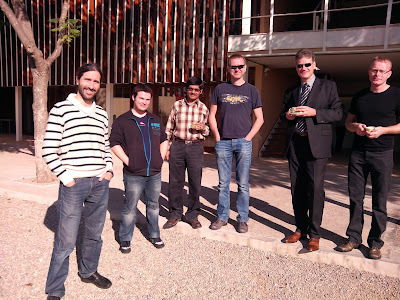 Our team spent last week in Mallorca. We visited DOME Consulting premises and meet the REMICS colleagues. We had a really fruitful workshop with end-users. They highly appreciated the progress - we can now fully generate SOA applications for JEE platform out of recovered UML models. Data, business logic and presentation layers are all covered with our Modelio tools. In addition, we made a good progress on planning work on PIM4Cloud. SOFTEAM currently provides graphical environment for modeling cloud deployments. Our colleagues from SINTEF did a great job on scripting language for deployment. University of Tartu presented engine for deploying and controlling scientific applications to the cloud. Next 6 months we will work hard on integrating these tools to complete our tool chain and automate deployment of SOA applications to cloud platforms. In the last day, we had EC review and commission highly commended our results. Well done, REMICS!